Shri Pranab Mukherjee assumed office as the 13th President of India on July 25, 2012, crowning a political career of over five decades of exemplary service to the nation in Government as well as Parliament. Eighty-one years old, Shri Mukherjee is a man of unparalleled experience in governance with the rare distinction of having served at different times as Foreign, Defence, Commerce and Finance Minister. He was elected to the Upper House of the Parliament (Rajya Sabha) five times from 1969 and twice to the Lower House of the Parliament (Lok Sabha) from 2004. He was a member of the Congress Working Committee, the highest policy making body of the Party for a period of 23 years. 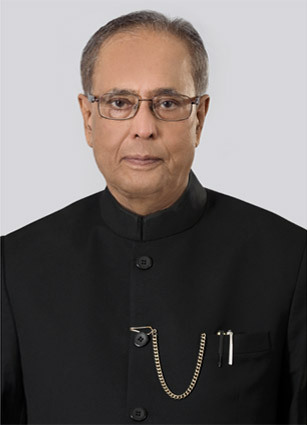 During the period 2004-2012, Shri Mukherjee was instrumental in spearheading critical decisions of the Government on a range of issues such as Administrative reforms, Right to Information, Right to Employment, Food Security, Energy Security, Information Technology and telecommunication, setting up of UIDAI, Metro Rail etc. through Chairmanship of over 95 Groups of Ministers constituted for the purpose. In seventies and eighties, he was instrumental in setting up the Regional Rural Banks (1975) and the EXIM Bank of India as well as National Bank for Agriculture and Rural Development (1981-82). Shri Mukherjee was also author of a modified formula for resource sharing between the Centre and the States in 1991 which came to be known as the Gadgil - Mukherjee formula. A powerful orator and scholar, Shri Mukherjee’s intellectual and political prowess as well as remarkable knowledge of international relations, financial affairs and parliamentary process are widely admired. He has been acclaimed for his role as a consensus builder on difficult national issues through his ability to forge unity amongst the diverse political parties that form part of India’s vibrant multi-party democracy. A man of humble origins, Shri Mukherjee was born in the small village of Mirati in Birbhum District of West Bengal as son of freedom fighters, Shri Kamada Kinkar Mukherjee and Rajlakshmi on December 11, 1935. Shri Mukherjee’s father was a Congress leader who endured great hardship including being sent to jail several times for his role in India’s struggle for independence. Shri Mukherjee acquired a Master’s degree in History and Political Science as well as a degree in Law from the University of Kolkata. He then embarked on his professional life as a college teacher and journalist. Inspired by his father’s contribution to the national movement, Shri Mukherjee in 1969 plunged into full time public life following his election to the Upper House of the Parliament (Rajya Sabha). Under the careful mentoring of late Prime Minister Indira Gandhi, Shri Mukherjee’s rise in his political career was rapid. He was made Deputy Minister, Industry; Shipping and Transport, Steel and Industry and Minister of State for Finance in the period 1973-74. He assumed office as Finance Minister of India for the first time in 1982 in the Cabinet of Prime Minister Indira Gandhi and was Leader of the House in the Upper House of Parliament (Rajya Sabha) from 1980 to 1985. Later , he was Deputy Chairman of the Planning Commission from 1991 to 1996, Minister for Commerce from 1993 to 1995, Minister of External Affairs from 1995 to 1996, Minister of Defence from 2004 to 2006 and once again the Minister of External Affairs from 2006 to 2009. He was the Minister of Finance from 2009 to 2012 and Leader of the Lower House of Parliament from 2004 to 2012 till he resigned to contest election to the office of the President. Shri Mukherjee has extensive diplomatic experience and has served on the Board of Governors of the IMF, World Bank, Asian Development Bank and African Development Bank. He has led the Indian delegations to the Commonwealth Finance Ministers’ Conferences in 1982, 1983 and 1984; the United Nations General Assembly in 1994, 1995, 2005 and 2006, the Conference of Commonwealth Heads of Government at Auckland in 1995, the Non-Aligned Foreign Minister’s Conference at Cartagena in 1995 and the Conference to mark the 40th anniversary of the Afro –Asian Conference in Bandung in 1995. A prolific reader, Shri Mukherjee has authored several books on the Indian Economy and on Nation Building. The many awards and honours conferred on him include India’s second highest civilian award, Padma Vibhusan in 2008, the Best Parliamentarian Award in 1997 and Best Administrator in India Award in 2011. He is recipient of Doctor of Laws Honoris Causa conferred by the University of Dhaka in 2013; and Honoris Causa conferred by the University of Calcutta in 2014. ; Honorary Doctorate conferred by the Russian Diplomatic Academy in 2015; and Professor Honoris Causa conferred by the Belarus State University in 2015.Honorary Doctorate conferred by the University of Jordan in 2015; Honorary Doctorate conferred by Al-Quds University, Palestine in 2015; and Honorary Doctorate conferred by Hebrew University, Israel in 2015 and Honorary Doctorate conferred by the Kathmandu University, Nepal in 2016.He was rated one of the best five Finance Ministers of the world in 1984 according to a survey conducted by "Euro Money” Journal published from New York and was declared ‘Finance Minister of the year’ for Asia in 2010 by "Emerging Markets”, the journal of record for the World Bank and the IMF. Shri Mukherjee was married to late Smt. Suvra Mukherjee (17.9.1940-18.8.2015), an accomplished singer of Rabindra Sangeet and an artist. He has two sons and a daughter. Shri Mukherjee enjoys reading, gardening and music in his spare time. Simple in his tastes, Shri Mukherjee is a dedicated patron of the arts and culture. An avid traveller, there are few parts of India and few countries in the world he has not visited in his illustrious and long public career.